This is the retail label given to a government sponsored group of teams within councils whose task is to encourage regeneration of high streets and town centres generally. The could certainly do with some damage limitation - face lifts at least - following the many big name collapses. Retail experts come in all shapes - Mary Portas who doesn't answer calls and Paul Turner-Mitchell who makes calls to pursue Freedom of Information enquiries - shedding light. £1.2 millon was set aside and paid to twelve pilot council schemes - £100,000 each. The balance unused circa £1 million remains in the various council vaults. The pattern is similar throughout - about 10% only spect each - since May 2012 - nine months ago. Urgency? In fact, I don't believe the Pilots know what to do with it - the 10% has often gone on nonsense, meetings and the ever-present consultants. Councils in the majority don't have the visionary/dynamic measures in planning/doing necessary to make a difference. 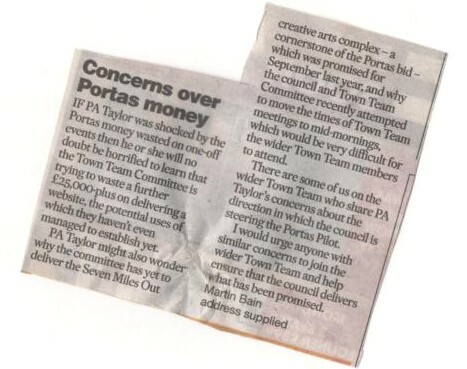 If they had, they would not have waited for the "Portas" connection but would have looked quickly at colossal town centre rents and planning logjams cause havoc. John O'Mara - Stockport Town Team - having had £462,000 but spent only £2,500 getting the team together. What have they done? funding, with £0.020m of the capital allocation having been spent in 2012/13. be completed by May 2015. £0.020m expenditure will take place 2014/15. It is envisaged that the remaining allocation of £0.077m will be spent in the current financial year. Parts of Greater Manchester have some of the highest rates of empty shops in the UK, it emerged today. Business leaders have vowed to stop the rot on the high street after the gloomy findings were released by the Local Data Company. The report revealed the north west as a whole remains the region with the highest proportion of shops lying empty, with the rate having grown from 19.7 per cent in 2011 to 20.2 per cent in 2012. When it comes to large towns – those with more than 400 shops – Stockport has the UK’s highest vacancy rate, with 28.3 per cent of shops unoccupied, despite a 1.8 per cent improvement on 2011. Iain Roberts, Stockport council’s executive member for regeneration, said: “The important thing is that we are heading in the right direction. There have been 29 new shop openings recently, mostly independent shops, and the Merseyway shopping centre had over a million visitors in December for the first time.“We can’t compete with places like the Trafford Centre when it comes to chain stores so we are trying to give people positive reasons to come here, like the special events at the market, and things are starting to happen for Stockport. ”For medium towns – those with 200 to 399 shops – Oldham had the UK’s fourth highest number of vacant shops. The rate now stands at 28.7 per cent, which is 2.4 per cent worse than in 2011.Paul Hughes, chairman of Oldham Town Centre Business Partnership, said one of the reasons for the decline was due to the tram line work. Mr Hughes, who also runs men’s fashion store Zutti, said: “Everything that can be done is being done in Oldham to attract businesses and shoppers. One of the reasons this has been a problem is because of the on-going work around the trams which has made it difficult for people to get in, although not impossible. “Once the tram line has been completed, connecting to other towns like Rochdale, I think we will see a huge difference in the number of people who come to Oldham, giving confidence to businesses to invest. ”Altrincham was seventh worst in the medium town category, with 27.1 per cent of shops empty, 1.4 per cent more than in 2011. Sarah Walmsley, of regeneration group Our Altrincham, said: “We don’t need a survey to tell us we have a dire situation in Altrincham. We have too many empty shops that should be used for other services. For example, we want to use one to run a recycling centre. That can help increase footfall into the town which would attract more businesses. ”Trafford Council’s corporate director of economic growth and prosperity Helen Jones added that in the six months to the end of January, 25 new shops had opened in Altrincham, compared to 13 that closed.For small towns – those with 50 to 199 shops – Eccles in Salford was the country’s second worst with 33 per cent of shops vacant, 2.7 per cent up on 2011. Middleton was ninth worst, with 24.9 per cent of shops empty, 0.5 per cent more than in 2011.Bolton had the fourth highest number of vacancies among large towns, with 26.6 per cent, up 3.5 per cent on 2011. But south Manchester suburb Chorlton has bucked the trend, posting a 9.5 per cent decline in the number of empty stores between 2011 and 2012, which now stands at just 6.7 per cent.Nationally, the number of vacant shops fell slightly from 14.3 per cent to 14.2 per cent." "Watching a Stockport councillor on the BBC's Newsnight last night explain why 259 people had to vote on every item of expenditure was painful. We need town centre champions, not a committee."